Win the Platinum Rig competition at the OCR World Championships! OCR has taught me so many lessons about life and helped me inspire others to conquer the obstacles that they face in every day. Our comfort zone is something that should be pushed every day! The sport encourages me to grow as an athlete and a person every day. I’ve also met some of the best people in the world through the wonderful camaraderie in the sport. How did you end up being a STEM ambassador? I am the product of STEM (Science, Technology, Engineering, and Math) outreach programs and I am who I am today because of all of the great mentors and family members that inspired me to pursue my degree in Engineering. Due to this support, I grew a huge passion for STEM advocacy and outreach. This passion was recognized by my company, who created this role for me to help inspire young minds to excel in STEM and pursue rewarding careers in manufacturing. My passion is now my profession! I saw a picture of you giving a TED talk in Miami. Can you summarize what a TED talk is for those who don’t know what it is. Were you nervous? TED is an organization on a mission to share “ideas worth spreading.” Speakers are curated through an extensive application and committee review process. The particular TEDx event that I spoke at was tailored to youth and I was selected to deliver a talk on inspiring them to excel in STEM. My audience had over 1,000 youth, parents, teachers, and administrators! I was pretty nervous, but like in a race, I’ve learned to channel my nerves into positive energy. I have the opportunity to inspire young minds and help them dream bigger than they may have otherwise. Hearing a young child say that they are an engineer or innovator is the best feeling in the world! Your name shows up in race results all around the country almost every weekend. How do you deal with all of the travel? Do the TSA agents recognize you whenever you show up to the airport? I’m almost as addicted to traveling as I am to OCR! I’ve only spent 1 full weekend at home in 2016 so far. It’s not as bad as it sounds, though. Traveling for OCR and my career has allowed me to expand my influence and helped me fulfill my mission to inspire others to reach their full potential. I’ve met so many wonderful people along the way and seen so many great places. Travel and OCR are among the few expenses that make you richer! The costs can add up, but I am fortunate that the Beachbody business that I’ve built helps fund my travel and OCR addictions! This year alone I will race in England, Canada, Puerto Rico, and more than 10 states! My ultimate goal is to grow my Beachbody business to the point where I can get on the road in an RV and travel all across the country and world competing in races and helping film a few with my coach Arnel from www.OCRTube.com. 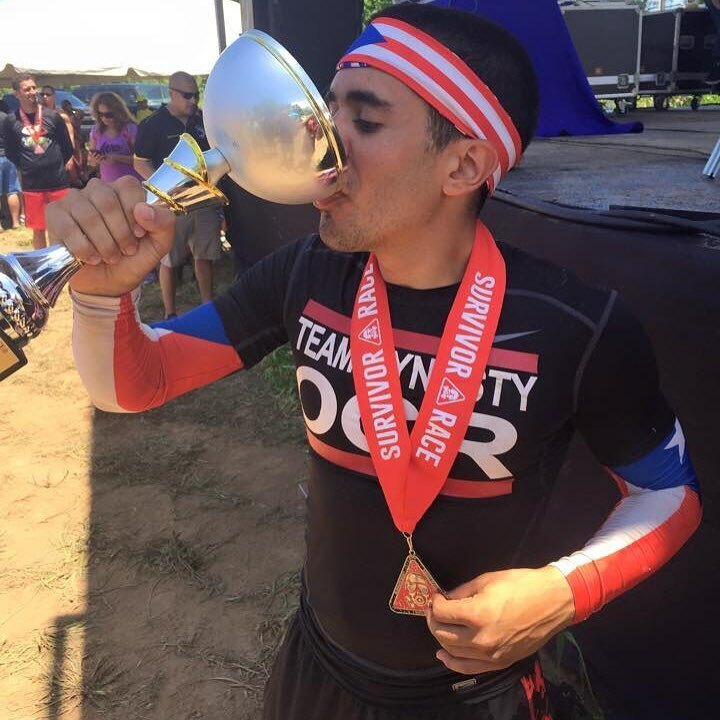 What is your role in Team Dynasty OCR? I’m a coach on Team Dynasty OCR. 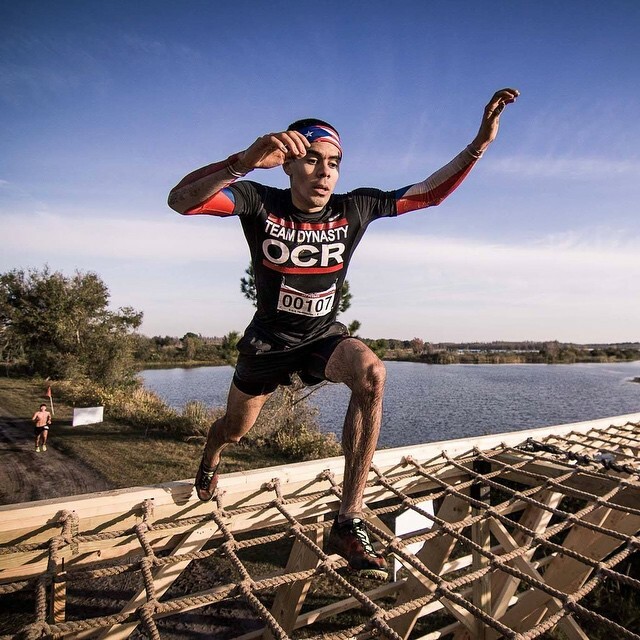 We are on a mission to help make fitness fun by introducing the world to OCR. We leverage Beachbody fitness programs, nutrition and supplements to help people get fit or go from open waves to racing competitive. No matter where people are along their journey we want to help them make the most out of their OCR journey. 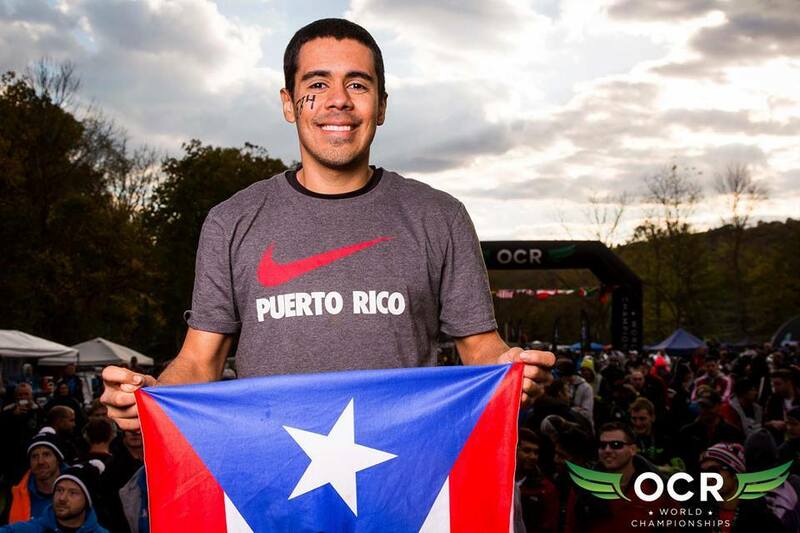 Why did you decide to wear a headband of Puerto Rico’s flag at races? That seems to be your patented look. My dream as a teenager was to represent Puerto Rico in the Olympic Games. At one point I told my mother that I wanted to box in the Olympics instead of going to college. That statement marked the end of my boxing career! 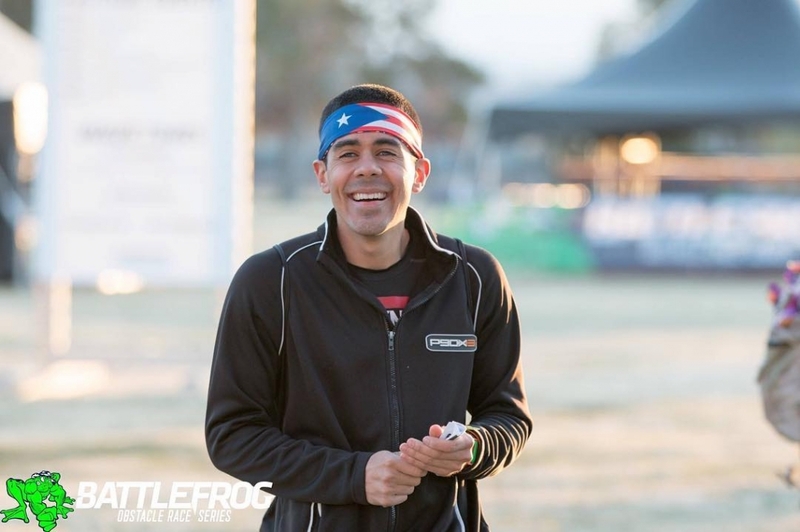 You had a few BattleFrog races last year where you spent 8+ hours on the course trying to finish the course. Describe what was going through your head after your first couple failed attempts and what motivated you to stay there all day and finish. I’ll never be the tallest or the strongest at a start line, but I promise you that there are few out there will as much heart and will power as me. There are no other option but to complete the course or be dragged off. My only DNF was at BattleFrog Atlanta and that was only because the last bus was leaving. I had the finish line in sight, but the combination of a tough Platinum Rig and lots of rain kept me from getting there. At BattleFrog Dallas last year I spent 8 hours on the course. It was the first time that I had ever been challenged in this way. Yes, both of these times sucked physically and mentally, but I am certain that I am much stronger today because I stuck to it and never gave up. I learned so much about myself and overcoming obstacles along the way. I doubt that there is anyone that has spent more hours on Platinum Rigs during competition as I did last year, and because of that, I am now one of the top performers on the obstacle! Never give up. You will always come out stronger on the other end. Fortunately, my injuries over the past few years have only kept me out for a short period of time. However, a major setback at the 2014 OCR World Championships was missing my connection flight from New York to Ohio. There were no flights that would get me there on time so I made the decision to rent a car and drive 10 hours overnight to make it to the race just in time for registration. It was a very difficult trip to take alone and toeing the line with the best in the world in my age group on zero hours of sleep was a challenge on its own. However, my passion for the sport and heart fueled me through the race and I ended up finishing 4th in my age group. What OCR accomplishment are you most proud of? Coaching my friend through a weight loss journey of close to 70 pounds and being there when he completed his first OCR. After completing the monkey bars he stated that it was the first time he had ever completed monkey bars in his life! Moments like that are what inspired The OCR Project (www.theocrproject.com). Which format do you prefer: doing a penalty exercise if you fail an obstacle or mandatory obstacle completion? As prize purses continue to grow and elite athletes from other sports migrate to OCR, some athletes will inevitably resort to performance enhancing drugs (PEDs), as is the case in literally every sport on the planet. Do you feel that PEDs are already an issue or will soon become an issue in OCR? I am very concerned about the integrity of the sport as it continues to grow. More than PEDs, I am specifically concerned with cheating on obstacles or skipping penalties. I’ve seen it happen way too often in the competitive waves. I hope that the leading organizations in the sport will set the tone for integrity as the BattleFrog Series has, as Coach Pain’s addresses it to the elite athletes before every race. This year’s OCR World Championships will feature a short course (3 km) and long course (15 km). Would you like to see more race series continue this trend of offering multiple distances at their championship race? I would love for this trend to continue. Our sport has many tremendous well-rounded athletes, but we are often racing at distances that may not play to our strengths. Just as you wouldn’t expect a sprinter to place well in the Olympic 5k race, many of our athletes that excel at a “sprint” distance may not perform as well at a Spartan Beast or BattleFrog elite distance. An ideal course for me would be very obstacle dense with an emphasis a significant influence from American Ninja Warrior. The Platinum Rig would be a signature obstacle with challenging lanes for the elite waves and “milder” lanes for the open waves. A very motivational, straight-from-the-heart address is a must for the start of EVERY wave! The festival area would be the heart of the event and key obstacles would be placed around it in order to make the event very spectator and family friendly. The course would be designed so that runners would “circle back” towards the festival area many times before the finish. The kid’s race will be just as important as the elite wave, too. There will be something to challenge and inspire people of all ages and people will have enough reasons to stay all day. The community will become a family. Do you have any other advice you’d like to share with the readers? No obstacle can stop you without your consent! Never give up on the journey!